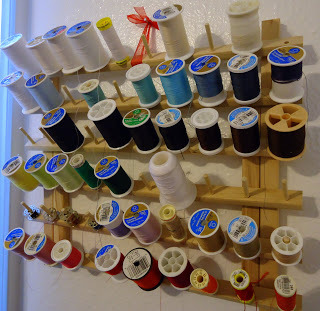 Over the years I have collected a lot of thread. When you have a lot of thread, a thread organizer is key to not losing your mind. I outgrew my thread organizer a few months ago, and that led to excess thread purchasing. I couldn’t see what I already had in my collection, so I kept buying more of the same thing. The extra black and white spools above are proof. I finally gave in and bought a wooden spool organizer. Instead of placing it on my desk, I tied the top with a ribbon and hung it from a nail on the wall. I love that I don’t have to go digging in a drawer to find the right color ~ everything is in plain sight!